The flames in the central ring create glowing patterns in the ripples of moving water that flow endlessly over the decorative stones. 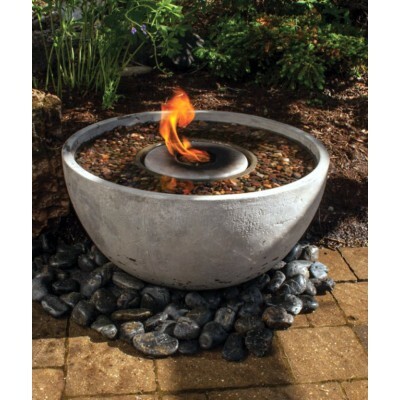 Size of Fire Fountain: Small 24" Medium 28" Large 32"
Self-contained water and fire features have been gaining in popularity over the last few years. Aquascape®, always the innovator, decided to add the beauty and elegance of fire to one of our GFRC or glass fiber reinforced concrete water features. The self-contained feature is a simple plug-and-play water feature with a fire feature in the center making it an ideal focal point or centerpiece to any outdoor setting. The Fire Fountain from Aquascape® combines the elements of water and fire in a unique water features perfect for backyards and outdoor landscapes. The bowl is constructed of durable fiber glass and mimics the look of a concrete bowl. 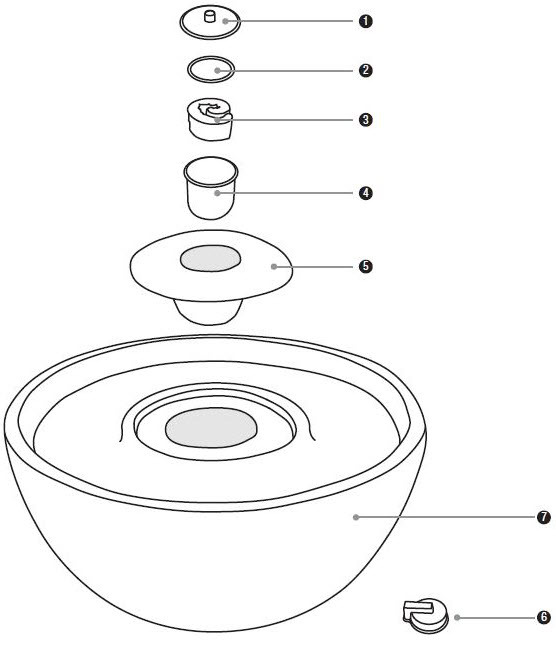 A pump (included) moves the water in what appears to be an endless loop of cascading towards the center of the bowl where a flame dances. 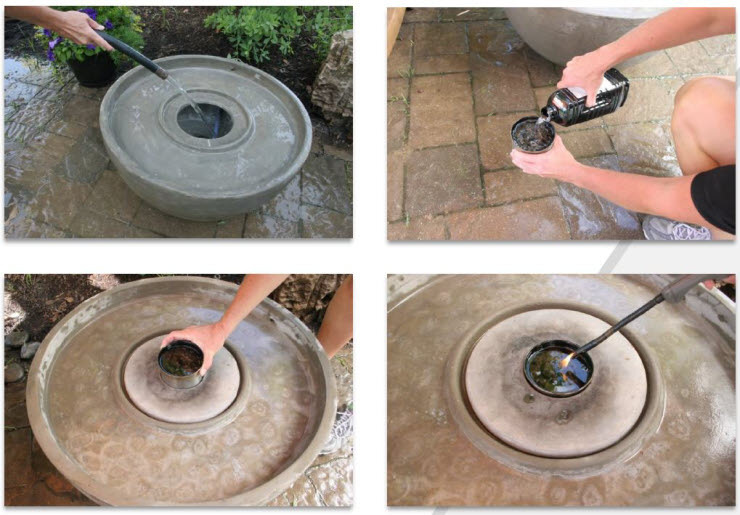 The Fire Fountain comes complete with a pump and tubing so all you need is some decorative stones or pebbles to place in the outer ring of the fountain and then insert the wick into stainless steel fire pot (all included) and add smokeless parafin or fuel gel (fuel not included). The result is absolutely breathtaking. The flames in the central ring create glowing patterns in the ripples of moving water that flow endlessly over the decorative stones. It is incredible in the evening with the sight of an Olympic style flame combined with the delicate sounds of water splashing delicately in the bowl. 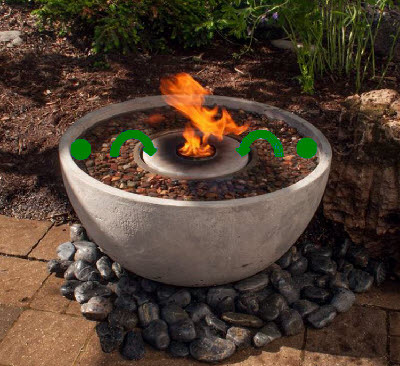 Fire Fountain available in 3 sizes 24", 28" & 32"
The water in the bowl moves continuously towards the center where it dissappears into the bowl and is recirculated by the pump. • In places where the area or enclosure under the appliance is well ventilated and away from electrical sparks or any other potential ignition source. • On a level surface capable of supporting the fountain. of the fountain, especially near the control area. gravel in the fire pot. • Do not operate the fountain during windy conditions. • Do not operate in or on recreational vehicles and/or boats.